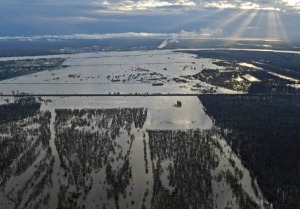 If levees stop floods, why is Mississippi’s batture still flooded? flood. Sorry, but the facts don’t fit that narrative. It’s still flooding in Mississippi – more frequent, longer, higher floods from Vicksburg to Fort Adams. Just look. Fact finding. I “testified” about this before the Mississippi River Commission on April 13 aboard the Motor Vessel MISSISSIPPI docked at Lake Providence. The occasion was the Commission’s annual high water fact finding cruise. Maj. Gen. Wehr, Commander, Mississippi Valley Division, Vicksburg, chaired the tightly scripted hearing. There were two other generals, an admiral, and three presidential appointees on the Commission, a brace of colonels facilitating, and a standing room crowd. I think my son George and I were the only witnesses who were not agents or employees of some government entity (e.g., port commissions, levee boards, development agencies, etc.) Many appeared to work closely with the Corps. Some were on first name bases with Commissioners. This was not their first rodeo. All knew the drill: schmooze the Commission and help get more MR&T funding. They were pros. We were amateurs. Some facts. We were the only heretics. We came to question the revered MR&T, not to praise it. We see Mississippi’s flood plains flooding more frequently and longer and higher. We see it first hand at our farm near Lake Mary in Adams County. And we see it from Natchez and Vicksburg river stages going back to 1950. It looks like Corps MR&T projects are part of the problem. I briefly explained this to introduce a short video with scenes and facts about the 70,000 acres between the river and the hills around Lake Mary and Fort Adams in southwest Mississippi: 6 floods over 80 days in last 10 years, 3 over 120 days in last 5 years. Farmers unable to plant in 3 out of 5 years. Insurance premiums up 50%. Timber and wildlife habitat damaged. Wildlife stressed. Property values down. County taxes down. Oil production down. Minerals and severance taxes down. County roads and bridges damaged and unsafe. Property inaccessible for months. A solution. After everyone had testified, there was another opportunity to speak. I suggested that the Corps MR&T project has passed the point of diminishing returns and aggravates flooding in Mississippi. Its cut offs have shortened the river and cause flood waters to get to Mississippi faster than they can be discharged to the Gulf. Hence, the water backs up and causes more flooding. I also suggested a solution: send more water down the Atchafalaya River shortcut to the Gulf via the Old River Control Complex south of Natchez. Pretty simple. Just takes an Act of Congress. The Commander tactfully told me in an aside that any decision to send more water to the Gulf would be made at the national level, not by the Corps. Will Mississippi’s congressional delegation be involved? Congress nationalized decisions about who to flood in 1928 when it approved the MR&T project. Previously each levee district and its armed guards decided as described in Will Percy’s “Lanterns on the Levee.” The decision put the Corps in charge of a levees arms race. After almost 90 years, it has achieved levee parity – detente. Higher levees protect land behind the levees against higher floods. But cause higher floods inside the levees. Bad geography. Mississippi bears the brunt of this batture flooding due to geography and political default. It’s at the bottom of the funnel that holds the water until it eventually flows out the spout to the Gulf. Its flooding will get worse unless Congress acts. Its politicians have defaulted on the problem. Louisiana politicians are taking care of business. They’ve got game. They got $12 billion for the completed New Orleans Hurricane Risk Reduction project and $13 billion authorized for the Morganza to the Gulf Project. These defenses for infrequent hurricanes constrain the river and restrict its discharge. This aggravates flooding in Mississippi every year. New Orleans hasn’t had a major storm in ten years. I presented written testimony to the Commission about this flooding including 65 year analyses of flood histories at Natchez and Vicksburg based on Corps river stage data. The patterns and trends are clear and ominous. Flooding is getting more frequent, higher, and longer. Looking ahead. The Natchez batture flooded every year the last five years – over 4 months in 2 out of 5 years. By 2020 it could flood over 6 months half the time. Vicksburg’s batture flooded 4 of the last 5 years – over 3 months in 2 out of 5 years. It could flood every year by 2020 – over four months half the time. Greenville’s batture flooded over two months in 2 of the last 5 years. It will get worse as flooding moves upriver. Backwater flooding will also get worse as more frequent and higher batture flooding blocks more water from the Yazoo and other tributaries from entering the Mississippi. A half million acres from Greenville to Fort Adams are now a holding pond. It’s time to drain it. Speed the water to the Gulf. Might make the river behave. It doesn’t like to be hemmed up. Our congressional delegation might make this happen if it gets in the game. Otherwise, there will be more Corps projects that help Louisiana and hurt Mississippi.